Advocate Brokerage and Denise Koslowsky Once Again Earn Top Honors From Chubb - Scarsdale Premier Insurance Agency | Advocate Brokerage Corp.
Advocate Brokerage and Denise Koslowsky for the 13th year in a row have been named among the insurance industry’s elite by the Chubb Group of Insurance Companies. Chubb named Advocate Brokerage a Cornerstone Elite Agency, an honor shared by fewer than 10 percent of the 8,500 independent agents and brokers who work with Chubb. As one of America’s oldest insurance providers, Chubb Insurance provides both personal and business insurance and was listed as one of “America’s 100 Most Trustworthy Companies” by Forbes. Chubb specializes in high net worth clients, and offers them a full range of personal lines products, including homeowners, rental properties, automobiles, watercraft, valuables (jewelry and collectors’ items) and more. Being a Chubb Cornerstone Elite agency provides Advocate Brokerage with continuous educational opportunities as well as preferred service teams to handle the agency’s business. Beyond that, it allows for Advocate Brokerage to be one of the preferred insurance agencies for Chubb customers. 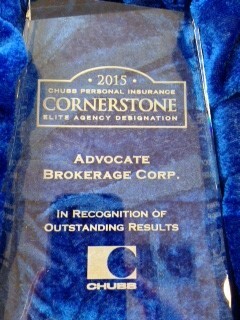 Advocate Brokerage works hard for the Cornerstone Elite distinction, and is proud to wear it again for the 13th year running. Additionally, we have recently been appointed a Chubb Strategic Partner. Advocate is one of a mere 50 agencies across the nation given this elite title. We look forward to strengthening our partnership with Chubb and are eager to see the positive impact it will provide for our clients.